Following is a description of the theater seating chart. Row A is the row closest to the stage, Row M is the row furthest from the stage. The numbered seating in each row is from stage right to stage left. The first row, nearest the stage, is Row A, and has 24 seats. Seats 12 and 13 are stage center, and are reserved for persons with disabilities. Seats 1-11 are on the right side of the stage, with seats 8-11 at roughly center stage; seats 14-24 are on the left side of the stage, with seats 14-17 at roughly center stage. The second row from the stage is Row B, and has 26 seats. Seats 8-19 are at roughly center stage, with seats 1-7 on the right side of the stage, and 20-26 on the left side. 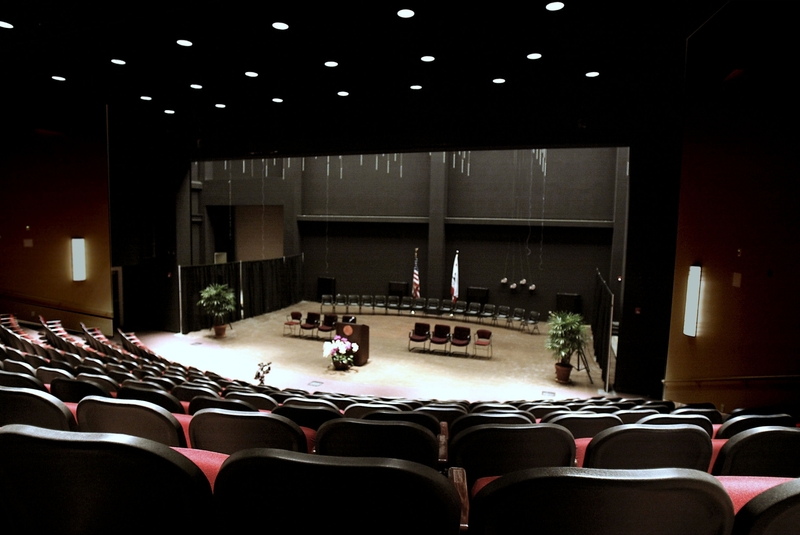 The third row from the stage is Row C, and has 26 seats. Seats 8-19 are at roughly center stage, with seats 1-7 on the right side of the stage, and 20-26 on the left side. The fourth row from the stage is Row D, and has 27 seats. Seats 8-20 are at roughly center stage, with seats 1-7 on the right side of the stage, and 21-27 on the left side. The fifth row from the stage is Row E, and has 28 seats. Seats 8-20 are at roughly center stage, with seats 1-7 on the right side of the stage, and 21-27 on the left side. The sixth row from the stage is Row F, and has 29 seats. Seats 8-21 are at roughly center stage, with seats 1-7 on the right side of the stage, and 22-29 on the left side. The seventh row from the stage is Row G, and has 28 seats. Seats 8-21 are at roughly center stage, with seats 1-7 on the right side of the stage, and 21-28 on the left side. The eighth row from the stage is Row H, and has 27 seats. Seats 8-20 are at roughly center stage, with seats 1-7 on the right side of the stage, and 21-27 on the left side. There is no row I. The row after H is J. The ninth row from the stage is Row J, and has 27 seats. Seats 8-20 are at roughly center stage, with seats 1-7 on the right side of the stage, and 21-27 on the left side. The tenth row from the stage is Row K, and has 30 seats. Seats 8-22 are at roughly center stage, with seats 1-7 on the right side of the stage, and 23-27 on the left side. The eleventh row from the stage is Row L, and has 19 seats. Seats 6-13 are at roughly center stage, with seats 1-5 on the right side of the stage, and 14-19 on the left side. The twelfth row from the stage is Row M, and has 8 seats. Seats 1, 2 and 4 are stage right. Seats 5, 7 and 8 are stage left. Seat 3 on the right, and seat 6 on the left are reserved for persons with disabilities.